SPRINGFIELD, Mass., Sept. 12, 2016 /Christian Newswire/ -- Christian leaders from around the world gathered in The Christian Cathedral on Friday September 9th to participate in the glorification of Saint Martin Luther King of Georgia. Archbishop Timothy Paul of The Holy Christian Orthodox Church proclaimed the sainthood after years of preparation. The Holy Christian Orthodox has 4.4 million members around the world. The Eastern Orthodox Church tradition is canonization to glorification. There are over 600 million orthodox Christians around the world. The glorification by the Holy Christian Orthodox Church will encourage acceptance by Christians around the world. Archbishop Timothy Stated "If people remember Martin with devotion, it is clearly a different kind of devotion than traditional saints have so often received. People do not honor him because he was perfect. They remember him with love, in spite of his messy life. They do not expect him to intervene in their lives to relieve their suffering. Rather, they look to his example for inspiration. Aware of his failings, they also recognize that his dedication to Christ's gospel motivated all the major decisions in his life. That dedication led him ultimately to his death, a death he might have avoided if he had been willing to turn his back on the gospel of Jesus and its demands." 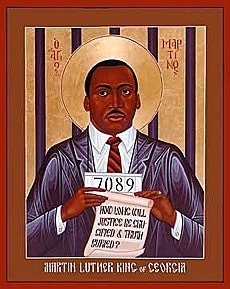 Saint Martin Luther king was not a great ascetic. His enemies relentlessly probed his affairs while he was alive and found that he had a weakness for the affection of women other than his wife. His life was as messy as most of ours. He was hardly an exemplar of the kind of virtue that endorses our religious institutions. Instead, he challenged attitudes bishops and laity had held for centuries. He didn't perform miracles while he was alive and hasn't performed any since his death. Yet millions of people remember and honor him as a holy man. The glorification ceremony on Friday, included the unveiling of the Saint Martin Luther King, Jr. icon and the inclusion of the sainted martyr in the All Saints Day observance and the date of his repose April 4th, in Christian calendars around the world.